Visit Metso in Hall 3, Stand F46, at Valve World from December 2-4, 2014, in Dusseldorf, Germany. Metso's experts will be available at Valve World to share ideas on how to lower the cost of your valve ownership and to discuss our unique state-of-the-art portfolio and service solutions designed to improve safety and productivity in the oil & gas, pulp & paper, and power industries. We'll be showcasing our latest innovations, the most comprehensive control valve line on the market, and our on-off and ESD valve offering. Our aim is to maximize production efficiency and reduce safety risks throughout the life cycle of a plant, starting from simplifying your valve selection, maximizing process availability and raising your production performance. All this contributes to a lower total cost of valve ownership. We're pleased to present one of our latest innovations, the new Metso Instrumentation Panel, which simplifies a vast range of process control valve-related instrumentation and functionalities, leading to greater reliability and a lower cost of ownership. Metso is also introducing a new Arctic temperature Neles ND9000 intelligent valve controller option to meet increasingly stringent certification requirements for extreme process environments. The new Arctic option now expands the ND9000 intelligent valve controller family and enables the controller to withstand temperatures from -53°C to +85°C. 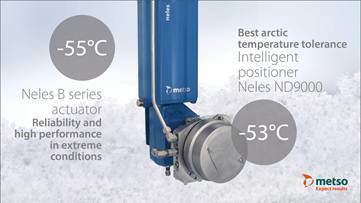 Additionally, we will showcase the Neles B series actuator, which offers reliability and high performance in extreme conditions and temperatures down to -55°C. Come listen to Metso's experts at the World Conference. Join us also for our 20-minute mini-seminars held at our stand twice daily. Reserve your seat in advance, as seats are limited. Metso's capabilities in noise and cavitation reduction technology are now enhanced with second-generation Q-trim and Omega trims. This advanced and patented technology solves all noise- and cavitation-related problems in the most efficient and economical way. A challenge in valve maintenance planning is knowing how to focus maintenance actions on the devices needing it. If you knew the valve condition in advance, wouldn't it create a big advantage in maintenance planning and action prioritization? This Valve Condition Analysis seminar introduces various ways to analyze the condition of your valves.